Baked beans and pork sausages in tomato sauce. In a tasty tomato sauce Stockwell & Co. provides all the traditional pantry essentials you need to put good, honest food on the table – at a price that's always right. 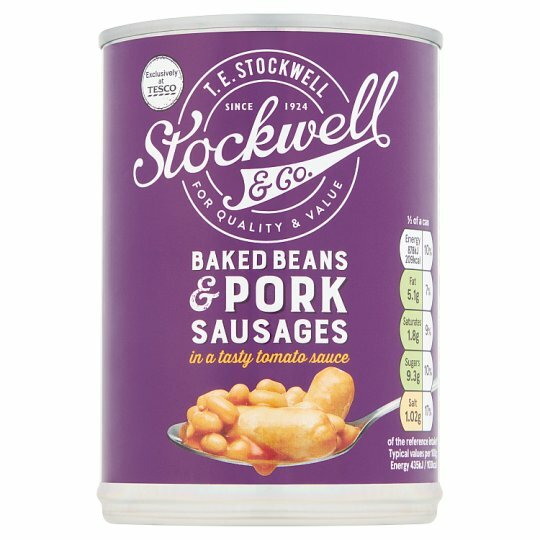 INGREDIENTS: Haricot beans (37%), Tomato Purée, Water, Pork Sausage (17%) [Pork, Water, Wheat Flour (Wheat Flour, Calcium Carbonate, Iron, Niacin, Thiamin), Pork Rind, Salt, Sugar, White Pepper, Ginger, Cardamom, Pepper Extract, Coriander Extract, Nutmeg Extract, Sage Extract], Sugar, Modified Maize Starch, Salt, Onion Powder, Paprika, Paprika Extract, Flavourings. Once opened, consume within 2 days. Once opened, transfer unused contents into a non-metallic container, cover and refrigerate. Consume within X days., Store in a cool dry place. Instructions: For best results, microwave. Empty contents into a non-metallic bowl and cover. Heat on full power for 1 minute 30 seconds (800W/900W), stir and re-cover then heat on full power for another 1 minute 30 seconds (800W)/ 30 seconds (900W). Leave to stand for 1 minute after heating. Stir well before serving.